The great thing about this holiday day is that you can make absolutely anything green and call it St. Patty's Day outfit. 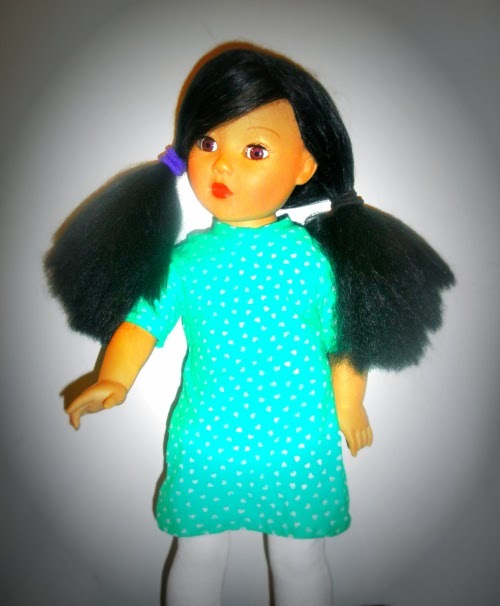 So this week I gathered up some green from my stash and sewed up a couple of good luck dresses for our dolls. Mia (the dark haired doll) is quickly becoming one of my favorite dolls to photograph I just love her features and the range of motion in her head that you don't get with the American Girls Dolls. If only I could get the pen marks off of her face. I would love some tips for getting ink off of dolls without damaging the paint if anyone knows any. Her Dress is made from a thrifted T-shirt that has been sitting in my refashion pile for over a year now. I was originally drawn to the beautiful shade of green and the darling little hearts, but unfortunately I didn't think about the the complete lack of recovery in the fabric, so the dress may not last very long before it becomes completely misshapen. Sadly the tights are destined for the same fate. They are made with a cheap rib knit that I picked up from a local discount store, and also has no recovery. Despite the problems with the fabric, I do love the pattern. I used Eden Ava Couture's Peppermint Snow Pattern for the dress and tights, as well as the shirt on the second doll. Caroline's tulip skirt was made using leftover scraps from the dress. This is one of my favorite doll skirts to make and it only takes about 5 minutes. Keep checking back. 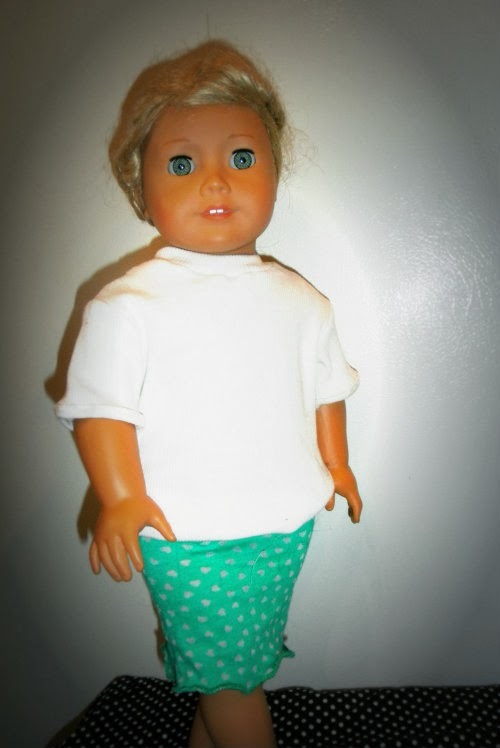 I'll post a tutorial soon so you can make your own 5 minute tulip skirts for your dolls.